For some reason, the Jackson Square District in San Francisco generally doesn’t get a lot of love. While a wonderful area full of 19th century, Gold Rush-era buildings, it’s completely dead after 6-7PM. The area is bounded by office buildings and little else other than antique shops. We’ve often wondered why there hasn’t been more of a scene down there as it’s an area ripe for liveliness given that it’s central to San Francisco, has few if any residential neighbors to piss off, and has a fantastic character full of brick buildings and historic architecture you just don’t find anywhere else. 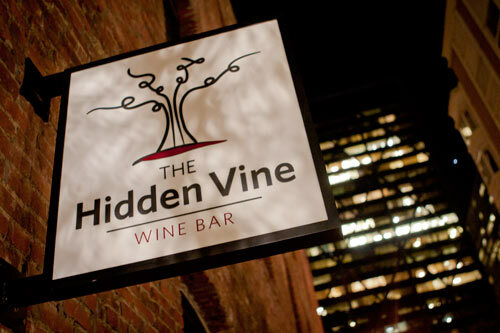 This appears to be changing as right next to Cafe Prague on Merchant Street (a small, one-way alley that dead-ends in to the Transamerica Pyramid) the Hidden Vine has reopened in a very new and very different setting. For those that remember the venerable wine bar, it ran its course for several years in the space inside the Fitzgerald Hotel which now houses The Barrel Room since August. When seeing the fantastic new digs for the Hidden Vine, it makes one wonder how, if this was their desired concept, were they able to stay in the small, cozy space of the Barrel Room for so long? It’s a completely different concept from what it used to be. For starters, there’s a freakin’ bocce ball court outside. Then there’s the main space itself which is a lavish, high-ceiling, wooden-floored, and classic-yet-chic interior. It’s sleek, modern, and will most likely appeal greatly to the Financial District crowd who are looking for a replacement to the London Wine Bar that closed some time ago if anyone actually remembers that old watering hole. Al (the owner) wanted the interior to be cozy and welcoming, a place were people chat and try out new wines, while being an upscale destination including a real fireplace from a 19th century home in the Mission. They have about 120 wines by the bottle and 40+ by the glass, although the menu isn’t finalized. That rather amazing wall behind the bar holds about 800 bottles, but they also have a cellar. Additionally, they’ll start running their regional focus each month, starting in November. For the soft opening that we attended, they were serving a great swath of their food menu which consisted of fantastic charcuterie, cheese, chutneys (by McQuades of course), pulled pork sliders, roast beef sliders, and a form of cheese puff that was delicious. Overall, it looks to be a mighty enjoyable place that will undoubtedly get packed by the after work crowd in no time.